It’s always exciting to start a new Amish novel, but when there are 4 in one book? Super exciting! In Amish Celebrations by bestselling author Beth Wiseman the reader is treated to 4 different novellas – The Gift of Sisters, A New Beginning, A Perfect Plan, and A Christmas Miracle. Author Wiseman is known for her many novels and contributions to novellas. Amish Celebrations will certainly be recognized and remembered for it’s heart- warming and heart- string- tugging stories of love, loss and redemption. Each of the 4 stories is unique but all written in Ms. Wiseman’s easy to read and enjoy style. I can’t say that I have a favorite among these stories (I like them all! ), but there is a nice variety that takes the reader through many different scenarios. 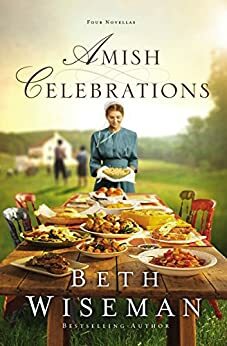 Anyone who enjoys Amish fiction will certainly enjoy Amish Celebrations by Beth Wiseman! If you are interested in reading more, or purchasing this book, you can click HERE! ~this post contains Amazon affiliate links. any purchases made through these links pays us a small commission, which helps keep the blog going, so thank you!